Line 10 North (L10N) Barcelona Metro. Updated January 2019. 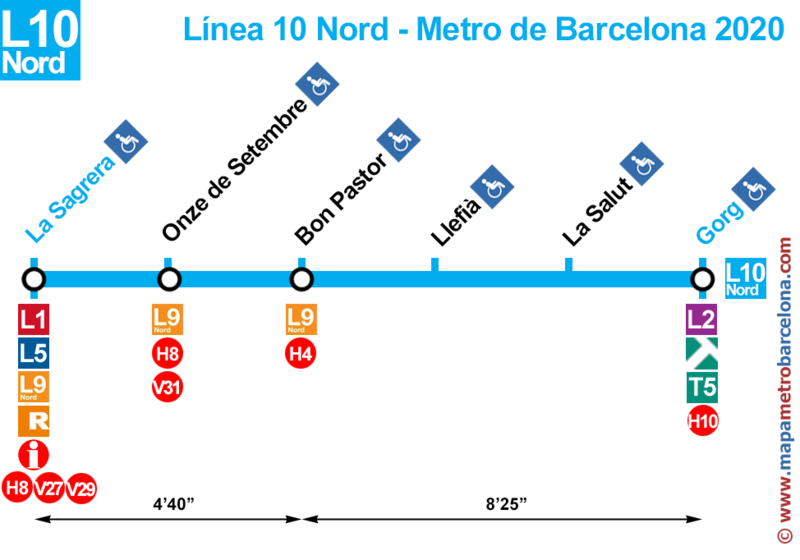 Here is the map of the metro line 10 North Barcelona, ​​the most complete and updated available on the Internet. Neither the official website of the metro, or our website competitors, have a map of line 10 North as ours. It has been made ​​from scratch and we have personally seen, in we take the data seriously. Barcelona Metro Line 10 North. This is the list of all metro stations of line 10 North. Next to the name of the stop, we've added if you can make a transfer to other transport. La Sagrera (transshipment: metro L1, metro L5, metro L9). Onze de Setembre (transshipment: metro L9). Bon Pastor (transshipment: metro L9). Gorg (transshipment: Trambaix (transshipment: metro L2). Thank you very much for your visit, we hope that our Barcelona Metro Map line 10 North has been useful to you.